For reciprocating compressors of Ingersoll-Rand, CPT Kirloskar pneumatic K.G. Khosla we can provide a complete range of Teflon based Piston Rings, Gude Rings, Gland packings, O rings, Plunger rings and many more. Customers have shown their trust on our firm due to offering best Acetal Guide Ring. This ring is safe from damage by pressure and heat. Quality approved these rings are superior in finishing and favored by patrons due to longer life working. 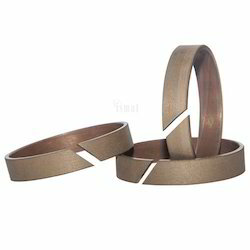 Moreover, we ensure premium quality of this ring. National Rubber Manufacturers & Engineering Co.
We are one of the prominent manufacturers of Guide Rings, which is primarily used on Piston Rods. 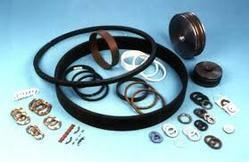 The guide rings of our organization are used to provide bearing and guiding surfaces between the piston rods. Furthermore, the guide rings eliminate metal to metal contact between the various surfaces. “We offer a complete range of Wiper series to meet industry requirements in various combinations of profiles and materials, matching a wide range of thermal, mechanical and physical properties. This includes both, standard and specialized Wipers.